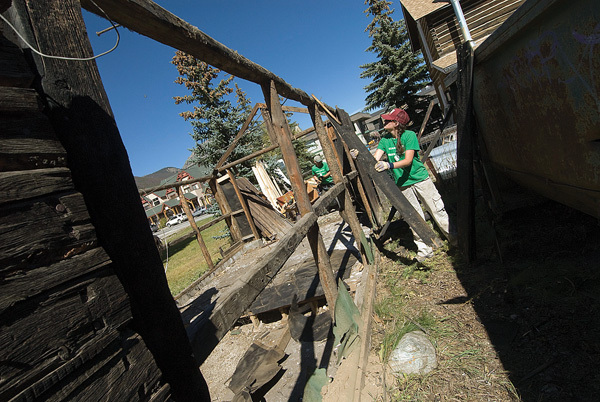 FRISCO – It took nine people two hours to tear down a shed behind High Country Conservation Center in Frisco Saturday to make way for a new, permanent greenhouse project known as The Living Classroom. Workers included HCCC employees as well as volunteers, HCCC Director Jennifer Santry said. Planning for the greenhouse, to be located on Main Street in Frisco, has been a partnership between the Town of Frisco, Matthew Stais Architects and HCCC. Recently, three more entities came on board with the financial backing for the project – a $10,000 grant from Colorado Garden Show and a matching $6,000 from LiveWell Colorado and the Summit Prevention Alliance. Matthew Stais Architects also donated approximately $10,000 of in-kind services, Santry said. Construction should begin in the next few weeks, as soon as a building permit is approved, Santry said. Colorado Garden Show’s grant funding rules require the exterior be completed by winter. Staff plans to work on the interior when the snow arrives. The Living Classroom is meant to support HCCC’s mission to promote sustainable food education in the community, Santry said. It should provide rental space for local residents to grow their own food as well as provide a permanent, educational classroom and demonstration site for gardening and sustainable living workshops. Santry said workshops could include topics such as composting, self-sufficiency and renewable energy. “How cool would it be to take compost from the landfill, put in here and show (elementary school students) they can grow food from their lunch waste?” Santry said. She added that the project is meant to support Town of Frisco’s zero-waste initiatives, so food produced in abundance at the greenhouse and community garden will be given to local food banks. There’s a plan to reuse some of the shed’s materials, such as a bathtub, a ladder, a wheelbarrow, cement blocks and wood taken from the structure. Santry said perhaps the bathtub could be a demonstration of aquaponics, or using a symbiotic, recirculating environment of plant and animal life to support growth. She added that much of the historic wood siding is being saved for use in Frisco’s historical park. Though there’s significant community involvement and interest – Santry already has a small waiting list of folks interested in growing space – and help from local organizations, the staff at HCCC is still looking for other in-kind donations. A cement truck would be helpful, Santry said, as would a large vehicle that could transport windows donated by a Breckenridge group. Wood, cement and rock are other items that would help the project along. And, though the project is funded through its first phase, Santry is hoping for funding for phase two – expanding the greenhouse area to include outdoor growing space. “The more money you have, the more you can do,” she said. For more information or to support The Living Classroom project, contact Jennifer Santry at (970) 668-5703 or jen@highcountryconservation.org.